Here I am in the t-shirt the nice folks at School Library Journal sent me for blogging about their wonderful Battle of the Books! I stole an idea from one of the other commenters and made a display to follow the progress of the tournament at the library. My co-worker took this picture this morning before I had checked today’s round. I did predict Megan Whalen Turner’s decision correctly. Greenwillow Books, 2010. 316 pages. I’ve been waiting eagerly for this book, the fourth about The Thief Eugenides. When it did arrive last week, sure enough, I didn’t stop reading until I finished, even though that severely cut into my time to sleep. I will probably reread it soon to savor it more slowly and catch the things I missed that I’m sure Megan Whalen Turner inserted all along. She has a way of writing books that get richer every time you read them. Again, I can’t say too much about the plot, because I don’t want to give away all that happens in the earlier books. This definitely is a book you would enjoy more if you read the earlier books first. Or at least you’ll definitely enjoy the earlier books more, because this book refers back to almost every surprising plot point in The Thief and The Queen of Attolia. I was fully expecting to be championing this book for this year’s Newbery Medal, but now that I’ve read it, I think it’s probably not enough of a stand-alone story to win. However, rabid fans of the earlier books (like me) will gobble it up and be excited that she’s definitely setting the stage for further exciting drama and conflict with the Medes. I strongly suspect that Eugenides will be up to some further scheming in future books, and I only wish that Megan Whalen Turner could write such brilliant books just a little bit faster! I like that this book featured our old friend Sophos from the first book, The Thief. In A Conspiracy of Kings, Sophos must grow into his heritage. He’s the heir to the throne of Sounis, but the book starts with his kidnapping. There are powerful people who would like to make him a puppet king with the Medes pulling the strings. Can Sophos find a way to escape that fate? Can someone who preferred poetry to swordplay and who blushes easily and can’t lie convincingly seize and hold a kingdom? If you haven’t yet read these books, full of adventure, danger, plots and counterplots, and wonderfully flawed heroes and heroines — order a copy of The Thief right away and get started! Today the second round of School Library Journal’s Battle of the Kids’ Books finished up! Even better, today I got my t-shirt! Well, okay, maybe that was only better for me. I won a t-shirt for blogging about the Battle. Pictures to follow. I simply have to wear it to work tomorrow, since my son’s at his Dad’s and can’t take the picture tonight. Now, it turns out that when I sent them my address, I should have requested them to send the smallest size they have. But it’s okay — I can always wear it as a tunic. I’m happier about the second round of the battle, because it turned out that, after predicting seven out of eight of the first round matches incorrectly, I guessed ALL four of the second round matches correctly. Do I have a better feel for how the judges are picking? Am I tracking better with these judges because I love their work? Or am I just getting lucky? Well, I’m on a roll, so I’m going to guess who will win the third round, the Final Four. Though I have to admit that I am fervently hoping that either Fire or Marcelo in the Real World will come back from the dead and win it all in the final round. Interestingly, both matches in the third round feature a nonfiction title versus a fiction title. That will be tough to judge. I think I’ll split my guesses between Team Fiction and Team Nonfiction. Hmm. If judges go with the book that is least like what they write, then Megan Whalen Turner would pick Charles and Emma. The Lost Conspiracy is very similar to the fabulous books Megan Whalen Turner writes — Her latest is even called A Conspiracy of Kings! Though Judge Turner’s books are less dark, both are fantasy books with intricate plots and a well-realized fantasy world. So, Judge Turner may notice flaws in The Lost Conspiracy that weren’t obvious to any but a skilled practitioner like she is. Or maybe, like me, she’ll be turned off by the genocide and focus on revenge in the book. However, The Lost Conspiracy is such a well-crafted book, and I still haven’t gotten around to reading Charles and Emma, so for the sake of prediction, I’m going to root for The Lost Conspiracy. Phooey. I’m a huge fan of Tales from Outer Suburbia. But I somehow can’t quite foresee Walter Dean Myers not taking this opportunity to extol Marching for Freedom. So there you have it. As I did in the first round so abysmally, I’m predicting that the judges will pick the book most like their own. I may be totally wrong. But the fun part is finding out! Again, I have to urge everyone to check out the Battle of the Books. The best part is hearing what these brilliant authors have to say about the books they read. Last year, I had hardly read any of the books, but the judges convinced me to do so without delay! Review of My People, by Langston Hughes, photographs by Charles R. Smith Jr.
Ginee Seo Books (Atheneum Books for Young Readers), New York, 2009. 36 pages. My People is a beautiful, glorious, gorgeous book. I can’t adequately speak in its praise. It’s also, I believe, the first time a photographer has won the Coretta Scott King Illustrator Award — but the award is completely deserved, as the images used are stunning and so wonderfully accompany the poem. Charles R. Smith Jr. uses incredible close-up pictures of African-Americans to illustrate each phrase. The faces are truly beautiful, radiant and glowing. I think my favorite pictures are the ones that illustrate the phrase “are the souls,” with children dancing, completely unself-conscious. But all the people featured — elders, adults, children and babies — are photographed in a way that makes us see the wonder of their joy and humanity. Truly beautiful. You simply have to see this book to understand how wonderful it is. School Library Journal’s Battle of the (Kids’) Books finished its first round today. Back before the battle started, I predicted who would win. Of the eight first round matches, I only got one right! Though there is some consolation. Eric Carpenter of the blog What We Read and What We Think conducted a poll as to the winners of each match. And according to the stats he has reported, in every case I chose the same book as the majority who entered the poll. So I’m in line with the other people following the battle, just not with the celebrity authors who are making the choices. And there’s some great writing going on by the judges. Getting talented wordsmith’s to say what they like about two books and why they chose won book over another was an inspired idea. Reading their comments will make you want to read the books you missed, even the ones that don’t win. That’s what happened to me last year with The Hunger Games. After hearing four rounds of judges extol it, I had to see for myself. My biggest disappointment of the second half was that the wonderful Marcelo in the Real World was beaten by Marching for Freedom. There was some consolation in how eloquently Gary Schmidt talked about the brilliance of Marcelo. The sixth match, Peace, Locomotion vs. A Season of Gifts was the only match in the whole Battle where I hadn’t read either book. So I wasn’t emotionally invested in that prediction. I’d like to see Marching for Freedom win. The seventh match was the only one I predicted correctly, with The Storm in the Barn beating Sweethearts of Rhythm. I read Sweethearts of Rhythm the night before the contest, and I thought Judge Anita Silvey summed up its strengths and weaknesses just about perfectly. For the last match, I had come close to predicting the winner, because I do admire both books tremendously, and I wasn’t sure which way the judge would go. Julius Lester went with the incredible and bizarre Tales from Outer Suburbia over the Newbery winner, When You Reach Me. This one is tough. Both are wonderful books in the graphic format. Will Shannon Hale go with the fairy-tale type element in The Storm in the Barn? Or will she be captivated by the quirks of Tales from Outer Suburbia? I think both books are brilliant, so I won’t be disappointed either way, but for the sake of prediction I will choose Tales from Outer Suburbia. Tomorrow morning, M. T. Anderson will start the first half of the second round, which I predicted last week. Will I do any better in Round Two? Random House, 2009. 8 hours, 30 minutes on 7 compact discs. Many years ago, I read Among Schoolchildren, a nonfiction book by Tracy Kidder, and was impressed by the thorough way he explored every aspect of his subject. Having been deeply moved by Immaculee Ilibagiza’s books Left to Tell and Led by Faith about surviving the Rwandan genocide, when I found out Tracy Kidder had written a book about it, I was eager to read it. This is actually the story of a Burundian medical student, Deogratias, who barely escaped the genocide in Burundi and spent six months on the run. The first place his escape took him was to refugee camps in Rwanda — just in time for the genocide to start there. There were several miracles in his escape story that could have so easily gone the other way. For example, on the day the genocide started, he hid under his bed in the medical school’s dorm, but forgot to close the door to his room. He was too afraid to get out from under the bed and close it, so he huddled under the bed in terror, hearing the killers coming and breaking down other doors and killing people. When they got to his room and saw the door was open, they said, “The cockroach has left!” and moved on. He escaped that night, walking through a building full of dead bodies. And that was only the beginning of a six-month ordeal. Deo’s troubles weren’t over when he arrived in New York City with two hundred dollars in his pocket. He found a job delivering groceries for fifteen dollars a day and spent his nights in Central Park. He tried to sleep as little as possible, since he had terrible nightmares from what he had experienced back home. But Deo survived. He made friends. He went to Columbia and later to medical school and did well. Now, he has built a clinic in his parent’s village in Burundi, bringing hope and health to people, easing the conditions that spawned the genocide in the first place. The website for his organization is www.villagehealthworks.org. When I looked at the website after having listened to the audiobook, I couldn’t imagine a worthier organization to support. Deo’s story is amazing. I was riveted and found myself lingering in the car to listen a little more when I got home from work. Immaculee Ilibagiza’s book, Left to Tell, is more a story of faith and forgiveness, as she had visions and miracles while she hid in a bathroom. In Strength in What Remains, Tracy Kidder takes a secular, objective view. You can tell he is amazed at what Deo survived and how he managed to process and deal with his memories, and then rise above his experiences and bring healing to his people. Tracy Kidder presents the facts, but the listener can’t fail to be inspired. I also did not realize how bad things had been in Burundi. I’d heard of the “Rwandan genocide,” and hadn’t realized that the same conflict between Tutsis and Hutus happened in Burundi as well, but lasted much longer in a civil war. I think of myself as relatively well-informed, but I knew nothing about Burundi until I listened to this book. I highly recommend that you listen to or read this amazing story. Yes, some horrible things happen that you won’t want to think about, but ultimately you will be moved and inspired. Xulon Press, 2009. 483 pages. Physician’s assistant Parry St. Amand was surprised when the brilliant, if socially challenged, Dr. Rand Szabo asks to have lunch with her. Then he surprises her even more by asking her to go with his team on a medical mission trip to a poor former Soviet satellite country. A doctor backed out at the last minute, and if Parry can’t go, they will have to call off the trip. The particular country involved has been having political unrest, and Parry’s friends and family think she’s crazy. But she doesn’t want to be the one to keep the team from helping where they are badly needed. She decides to go. There are nine people on the team, including two other women, most of whom Parry knows from the hospital. However, three of the men are engineers, to help set up equipment and do repairs. One of those, Jake Spengler, is a former Ranger, who happens to be handsome and single. He has some tips about how to stay inconspicuous when traveling in a politically volatile area. The team arrives at their destination and bunk in an orphanage run by wonderful, caring people. They have a busy surgery schedule, putting in long days. Then the unthinkable happens. The country has a military coup and the new dictator has put a price on the heads of Americans. The team plans to smuggle out six people in vehicles, but the remaining three need to hike out, through rough terrain and the fresh snow of an early winter. Rand and Jake are natural choices, but Parry insists that she is the most fit of those who are left. So the three of them set out on the grueling trip overland, trying to stay unnoticed, but also to stay alive. Once I got to that part, the story gripped me and wouldn’t let go. I read into the early hours of the morning on a night when I really needed to get some sleep. I expected narrow escapes, physical challenges and plenty of danger, but A. M. Cormier gave them to me with details I didn’t expect at all. I need to admit up front that the author is a friend of mine, and I’m reviewing the book because I want it to do well, for her sake. For the sake of my readers, I will admit that I wish my friend had not decided to self-publish. Mission seems to me to be just a professional edit away from being a truly magnificent book. There are some flaws — some scattered misspellings and some gratuitous political rants that have little to do with the plot. Most challenging is the slow start — you could completely skip the first chapter without missing it — but I’m here to tell you that if you persevere, the book will be worth it. If anything, the author goes too far with the old adage, “show, don’t tell.” There are a few places where she gives us a scene or a flashback scene when all we needed was to be told what happened. We don’t need a flashback to understand that her family is pressuring her to get married. And more interesting than a flashback of her former romance would be to hear her explaining it to her new love. Those are nice scenes, but they do interrupt the flow of the book. Yes, there is a new love in Parry’s life by the end of the book, and I love the way the romance is handled. This, too, had some nice surprises, and I found it beautiful and satisfying. Another strength of the book is the author’s facility with medical terms and procedures. You can tell she’s worked in medicine, and her descriptions of medical situations the team faces all ring true. I should also say that as a reviewer I have a strong prejudice against self-published books. This is based on how many I’ve seen that are truly awful. However, I honestly believe that Mission is an exception. I admit that fondness for my friend kept me going through the slow start, but it was not friendship that kept me reading until early morning! It was the suspense of wondering how these characters I’d come to care about were going to survive. I feel risky calling the book “wholesome.” I don’t want to make it sound boring, because it’s far from being that. But it’s refreshing to have a main character with morals, who thinks about how she can honor God and serve others. Unlike the political views mentioned, the talk about God doesn’t come off as preachy at all — just a matter-of-fact part of Parry’s life. So if you’d like to read a story about people trying to do something good and then getting caught in a dangerous situation, with good, old-fashioned suspense and a dash of romance, give Mission a try. Candlewick Press, 2009. 61 pages. I think this book is so cool! It explains the math and geometry behind the sizes of living creatures in a way that is clear, easy to understand, and completely memorable. “In comics and movies, superheroes zoom across the sky, run up wall, lift things as big as buses, and use their powers to fight giant monsters! “It’s all very exciting, but it’s a complete load of nonsense. Real humans can’t fly, hang from the ceiling, or even lift things much bigger than themselves . . . and real giant animals couldn’t exist, since they wouldn’t be able to walk or breathe. The basic rules she talks about come from the math of three-dimensional objects. If you double an object’s length, its cross-section will have an area four times bigger (since it’s squared), and its volume will be eight times bigger (since it’s cubed). The authors show this beautifully with plenty of illustrations. Now I knew about this math, but I hadn’t thought about the repercussions in regard to living creatures. They start by looking at flight. It’s easy for a fly to take off. But if you were to double the dimensions of a fly, suddenly its wings would be four times bigger. That’s a problem, because its volume is 8 times more, so it weighs eight times more than before, so the wings aren’t going to be big enough to get it airborne. “This is why heavier insects, like dragonflies, need very big wings to get them off the ground, and birds need huge chest muscles and large, feather-covered wings. Next they look at insects that can walk on water and animals that can walk on the ceiling. This has to do with surface area related to volume. Again, if the surface area gets bigger, the volume gets bigger much faster. This is also why we can’t lift buses. Our muscle strength depends on the cross-section size of our muscles, but weight depends on volume. A rhinoceros beetle can carry 850 times its own weight on its back, but humans sure can’t do that. The illustrations accompanying this story are especially fun! And so it goes. The book goes on to look at how you need room for enough internal organs to take care of the business of life, especially surface area in the lungs. And there are more implications of size: Being able to stay warm, being able to digest things, being able to hide from predators, and so many more things. The only down side to reading this? This book may dampen my ability to write fantasy stories about flying unicorns or dragons. But those are fantasy anyway, right? With its clear explanations and fun cartoon illustrations, this book will make you look at the world with new eyes. A wonderful book for budding scientists, but also for anyone interested in the world around them — like me! 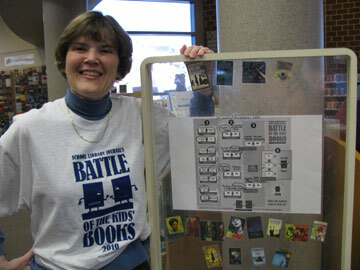 Last week, I posted my predictions for School Library Journal’s Battle of the Books. Well, the first half of the first round is over, and if you want to know who won — it was every book I did NOT predict! My strategy was to guess that the celebrity author judges would pick the book most like the ones that they themselves write. However, I’m beginning to suspect that it’s easier for them to see flaws in books similar to their own. Do check the Battle website. The rationales the judges gave for their choices are interesting and entertaining and will make you want to read both books. All the judges — with the notable exception of the one who shot down my favorite — spoke in high praise of the book they did not pick, as well as the book they did pick. Now that we know which books have advanced to the first half of the second round, I’ll make predictions about those matches. Honestly, I’m tempted to predict the ones I do NOT want to win — that way they won’t win! Actually, I don’t really care about these two matches, now that my favorites are knocked out. Now I hope that Marcelo wins it all — unless Fire comes back from the dead to challenge him. M. T. Anderson doesn’t seem like someone who would fall so much for a girls’ book. (But I’ve definitely been wrong before!) I’m going to predict that Charles and Emma will win. I’m going to predict The Lost Conspiracy, since I’ve read it and it is an exceptional work of imagination. With this one, I’m not emotionally invested in my choice, though — since I thought The Lost Conspiracy was an awfully dark book, and it won my imagination, but not my heart. Perhaps I should be hoping that the weakest books win, to give the winner of the second half (I like almost all those books better than these!) a better chance! I am enjoying, despite my disappointment in the choices so far, that there is no criteria given to the judges. It points out that different people like different types of books, and how rather random this whole thing is anyway. It’s a fun way to highlight sixteen exceptional books, with everyone realizing that this is by no means an objective contest. You are currently browsing the Sonderbooks blog archives for March, 2010.